This is a new dust seal for our upcoming French thread bottom brackets. Here is a new, but more retro, design for the top of our VO alloy headset. These are some of our new fender hardware bits. What do you think of this new fender stay design we're testing? It's very easy to adjust and does not require cutting. New Velo Orange hang tags; you might soon see these in your local bike shop. And, finally, this is a new alloy chain guard we'll be importing. Our version will be silver. Russ, The Epicurean Cyclist, applied toe clip leathers on his VO Retro cages with very nice results. 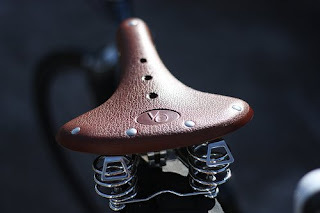 Austin on Two Wheels has a nice, and very positive, review of the VO model 8 saddle. John's Saluki build is beyond nice. It is absolutely stunning! 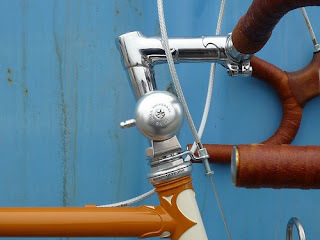 Note the Nitto stem he had chrome plated. And the Luxor taillight. Wow! The rest of the photos are here. The new factory that will be making our racks has all the tooling set up and showed us production samples of porteur racks, rear constructeur racks, and decaleurs. They are all stainless steel and look fantastic. The quality is much much better than I'd hoped for. These are the new pre-drilled versions that should make mounting much simpler. We will have the samples in our office in a couple of weeks (They didn't fit in our luggage.) As soon as we check all dimensions and mount them on a few bikes we'll OK the production run. They should arrive here 8-10 weeks later. The front rando racks, in canti mount too, are the next project. We dropped off plans for the Rackaleur plans and should be getting prices for tooling and production in a few weeks. 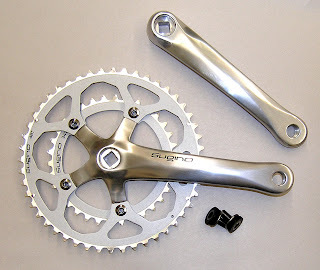 Here is a photo of the 110/74 Sugino double crank I mentioned. It will be silver; they make strange colors for display. It has outboard bearings. I don't have pricing yet, but would imagine $150-$175 with the BB. The crank is aimed at Gran Fondo riders. At the factory that makes our fenders we analyzed and discussed fender hardware for a very long time. The owner was very receptive to our needs and seemed glad to get the feedback from our customers that we passed on. His factory has been making metal fenders for bikes and scooters for more than 30 years, but I get the feeling that it's rare for clients to be so involved in the design process and he seemed to appreciate it. The factory will make several changes to our hardware that should, I hope, make it even better than Honjo hardware. I'll also soon post a photo of a new stay design that we may use. By the way, we will have a VO Daruma bolt. Additionally there will soon be polished versions of VO alloy fenders. A little later we'll have a VO hammered fender or two and we'll be ordering tooling for some new shapes. 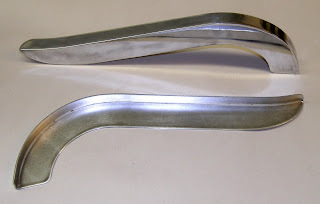 Our handlebars are made at three different factories and we discussed the new VO drop bars with two of them. I hope we see at least one of the new models this summer. I was glad to see sophisticated testing machines at the various factories. 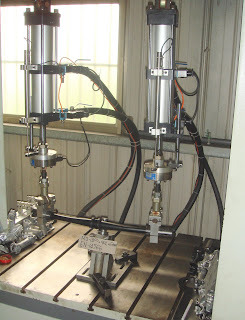 The photo is of a machine that tests handlebars for fatigue failure; it repeatedly pushed down on the bars. 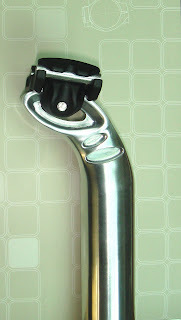 We are also looking for a second model of VO seat post. This one will have moderate setback and cost a little less. We saw a few interesting new designs, but this one struck me as being particularly well thought out. It is very smooth and easy to adjusts as well as being light. There is another 2-bolt post I'm considering as well. Finally, here's another interesting stem design. 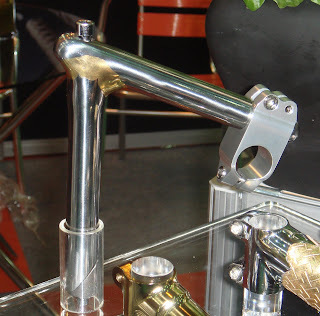 How about this fillet brazed chrome plated stem? The manufacturer can make a quill version too. These are on our short list! 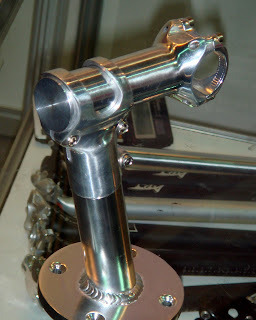 Or you may prefer a chromed lugged stem. Or an adjustable stem? Or two? 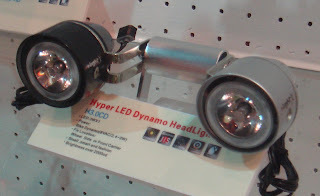 I was also impressed by this dynamo headlight, very bright and with a wide range of mounting options. And there are these new and less expensive barcons for 9 and 10-speed. Here is a new bar shape that might be worth trying. There's a lot more, but I didn't have time to photograph everything. There is a new and relatively inexpensive double kickstand that gets narrower when raised, not unlike the Pletcher we now stock. We saw a new Sugino 110/74bcd double crank. We also investigated making a new VO saddle bag support with a quick release feature. Tom has a post about the show too. 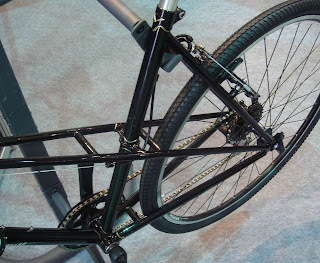 The first two days of the Taipei Cycle Show have yielded some very pleasant surprises. Not 30 minutes after getting to the show we ran into a manufacturer we work with who told us they could make the VO chain guards. We had previously approached a number of manufacturers about making these and none were interested, so this was indeed a pleasant surprise. We still have to work out the details, but I'm hopeful that we can come to an agreement on tooling cost, minimums, and price. 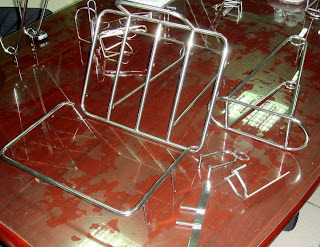 The same manufacturer also has a new stock alloy chain guard that we may import. 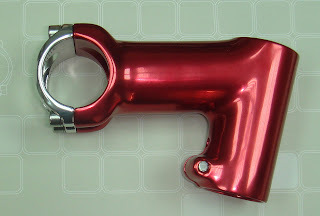 We found a new brake lever that some might be interested in. And there was a grip specially made to work with inverse levers on 22.8mm bars. The grip has a groove for a brake cable. We have ordered samples of the mixte frame I mentioned earlier. If it passes our testing we should have frames in the Fall. We will spec fender mounts and all the usual VO details, but this is not our design; it's basically the manufacturer's stock design. I was very excited to finally see the new VO saddle model that will compete with the Brooks B-17. We found a very nice MA2 style rim extrusion that can be made for us in 700c size. It's light, 19.5mm wide, and can be fully polished. Samples will arrive in a few weeks. We also saw a number of new bits from various manufacturers that might be worth investigating. 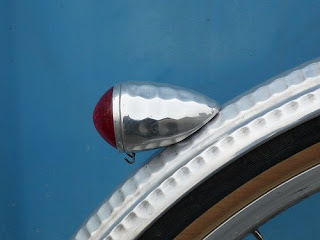 Among these is a new LED dynamo headlight purpose-made for rack mounting (or fender mounting? ), cloth bar tape from a new manufacturer, and several new models of quick-release pedals. 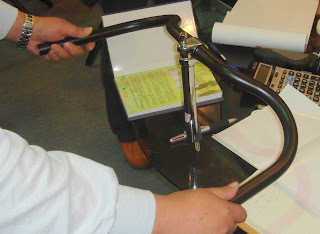 Of course we had several meetings about ongoing projects and new components such as VO drop bars. In short, it's been one meeting after another and both Tom and I are completely beat. The next two days will be a little easier with fewer meetings scheduled, so we'll have time to walk around the show looking for new products from manufacturers we've not worked with in the past. Then we hop on the bullet train and head south to visit factories and see, among other things, how our new racks are progressing. Since Tom and I will be in Taiwan and it's been super busy on the web site, we've decided to close the showroom next week. We'll re-open it on Tuesday, the 23rd. Web orders will ship as usual. Tom and I will try to answer tech question in the evenings, but we would appreciate it if you held off on non-essential questions until our return. 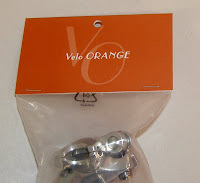 VOI just received a huge shipment from Sugino and have a new crank set, the XD700 with 48-34 rings. This makes a less expensive alternative to the Alpina. 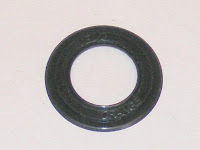 We also have the Sugino chain ring guards in stock again, now in two sizes. One new thing we will be looking at in Taiwan is a rather traditional production lugged mixte frame. A certain factory, and almost certainly not the one you're thinking of, may be offering such a frame as a stock item. It's not a VO quality frame, but if the quality and price are reasonable we may import it anyway. I'll try to convince them to add a low-trail fork and fender mounts. Maybe with lilac color paint? If you have any last minute suggestions for other stuff we should look for (there was a post about this previously) please comment. 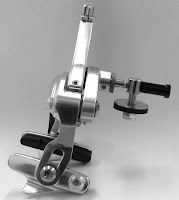 We've updated our VO and Honjo fender mounting instructions and here they are. Feel free to add additional tips in the comments. If mounting undrilled fenders you'll also need a drill and 5mm bit. Plus a 3mm bit if attaching an L-bracket. A file and sharp punch or nail are also nice to have. 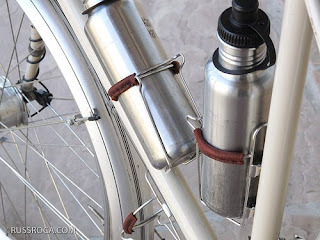 Attach the stays to the fenders using eyelet bolts. We like the bolts about 15cm from the aft end of the fenders, but the exact distance is not critical. Some model fenders come with one draw bolt per fender, others with two. Our Honjo extra long models are pre-drilled for the bolts. On other models, mark the location of the bolts and make an indent with a punch or sharp nail. Drill a 5mm hole for each bolt. 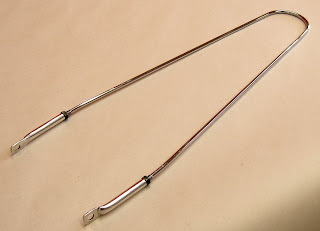 Most Honjo fenders use two eyelet bolts per stay. The VO fenders use slightly thicker aluminum and so require only one per stay. Thread the stay into the draw bolts and secure the bolts to the fender with a washer and locknut. If using two bolts per fender you'll need to flex the fender and stay to insert both bolts at once. 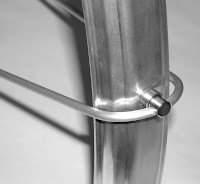 If your bike has a fender boss under the fork crown, as VO frames have, fenders without L brackets can simply be attached with 5mm bolt and washer. But be sure to use a leather washer between the crown and fender. The leather washer absorbs vibrations and cushions the fender, helping to prevent cracking at the bolt hole. Note that leather washer must be ordered separately. 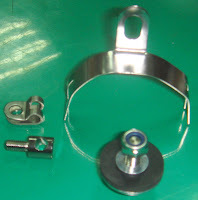 If using a VO or Honjo L-bracket secure it to the brake bolt. On undrilled fenders you'll need to drill two 3mm holes and mount the bracket as shown in the photo. On some forks it's necessary to bend the top of the L-bracket outward a little bit to allow it to clear the headset. If using a fork crown daruma, remove the brake, hold the daruma inside the fork crown and thread the brake bolt through the 6mm hole in the daruma. On undrilled fenders, drill a matching 5mm hole in the fender. Again, the extra long Honjos are pre-drilled and “dimpled” so the fender sits right over the wheel. Place the large metal washer, then the rubber washer over the threaded end of the daruma.. Secure the fender with a flat washer and nut. On fenders that don't have a pre-formed “dimple” for the daruma, push the fender forward, making a small dent in the fender under the fork crown. 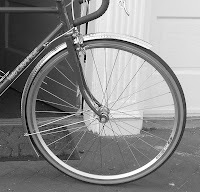 This compensates for the fork rake, allowing proper fender alignment with the wheel. Place the R-clips on the stays and screw them to the eyelets on your front dropout with 5mm screws. Hint: removing the quick release skewer makes it easier. Adjust the stays for a perfect fender line. You'll notice that the stays are too long; mark and cut them to length with a hacksaw or large wire cutter. File or sand down the ends so they aren't sharp. On a VO or other well-designed frame there will be bosses at the brake bridge and the chainstay bridge and plenty of room for the fender. All you'll need to do in that case is drill matching holes and screw the fender into place. Don't forget the leather washers between the frame and fender. On most production frames things are a bit more difficult. You may have to bend the front of the rear fender to make it fit between the chain stays then bolt it into place through the hole in the chain stay bridge. But don't do this yet; first install the sliding bridge bracket. 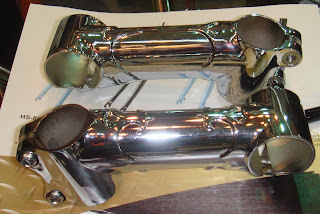 The VO version is made of malleable metal that you fold over the fender then pinch shut with pliers. 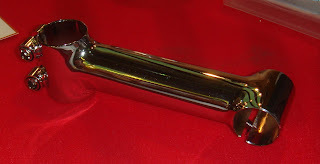 The Honjo sliding bracket slips on over the fender from the end and is then pinched shut. 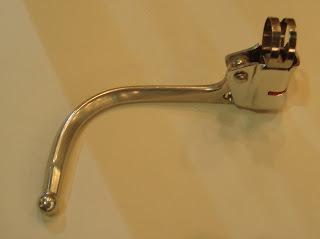 An L-bracket may be substituted for the sliding bracket. Finally attach and trim the stays to the dropout eyelets as you did on the front fender. Check that all the screws, nuts, and bolts are tight, (don't forget to reinstall those quick release skewers) and go for a ride. After a few miles check that everything is still tight. I'm trying to catch up after my mini vacation, so no time for along post today, but Tom wrote a couple of interesting things on the VOI blog. First is an article about our trip to Taiwan next week and about corporate social responsibility. Here's the link. 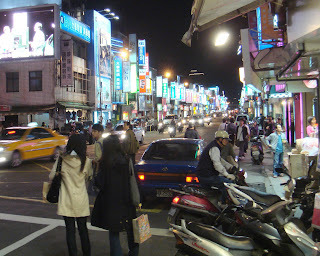 Speaking of Taiwan, I can't wait to go to one of the the night markets in Taipai for street food. 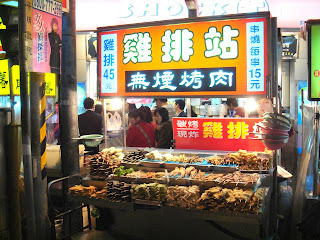 I actually like stinky tofu and dried squid and bubble tea. 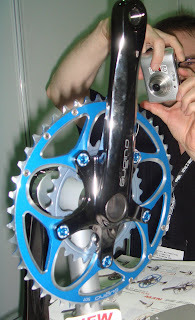 It seems there is some interest from a major crank manufacturer in producing a TA Cyclotouriste-style crank set. This is not the same project as the crank set VO still hopes to have manufactured one day. A bit more info here. Finally, we try to run a mostly paperless office here at VO. Even your receipts are e-mailed instead of being printed out. We do, however, include paper instruction with some products, though not all. I think we should start including paper instructions with fenders, rather than asking you to go on line to read them. It seems to me that having the paper copy in front of you when installing them is far more convenient. Any thoughts? I'm very gratified that this blog has evolved into place for serious discussion about bike, and other, matters. We get more comments and better discussion than most of the bike blogs I've seen. But I've noticed more and more impolite comments here lately. In fact, I've noticed a breakdown in civility recently on several other blogs too. In almost every case the offending words are posted by an anonymous commenter. So I'm considering changing the blog settings so only registered users can leave comments. Basically, you would have to use a screen name. Is that a good idea? Anyone have an opinion? Also, I'm off to Puerto Rico for a few days of hiking and swimming. VO will continue to function normally, but I may not be able to answer e-mails as there is some ambiguity about web access where I'll be staying. Tom, however, will respond to technical questions. 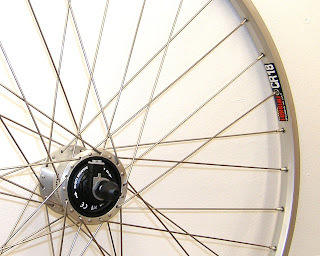 Shimano 105 hubs laced to Sun CR18 rims. They are available as sets, or as just front or just rear wheels. Shimano DH-3 Dynamo hubs laced to Sun CR18 rims. And we still have our fixed gear wheel sets. All the wheels are 36-hole and 700c sized only. We are still working on the 650b rims. I've posted a few NAHBS photos here. These are just random things that I found interesting. There are far better and more complete NAHBS photo-sets out there; please feel free to add links in the comments. Also, we had an unusually heavy snow storm here in Annapolis so many orders placed over the weekend and Monday will arrive a day later than normal.